The Cast of Mysore Masala were present at the Annual Comic con event which was held in KTPO Whitefield. The team had a 20 minutes stage presence where they got to interact with audience about the movie. The diverse and upbeat audience quizzed the cast on various topics ranging from science fiction to Heritage and its representation in Mysore Masala. The Mysore Masala team also had an inviting booth showcasing the engaging film teaser, film promotion and a massive photo booth. 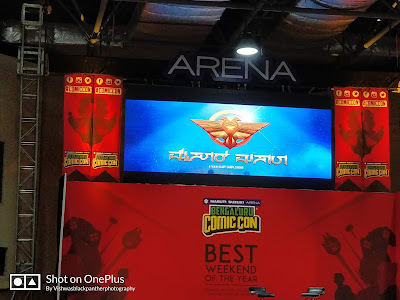 Comic con is an annually held event which believes in creating events and giving their fans, exhibitors and partners a platform to celebrate their undying love and passion for comics and pop culture. It Exhibits products such as a wide range of comics, novels, graphics, merchandise, toys, games, films, animation etc. Mysore Masala will be starring some of the biggest names in the Kannada film industry including Anant Nag; renowned theatre personality and veteran actor, who has acted in more than 60 films in various languages. The film will also feature Prakash Belawadi, a senior journalist and a theatre personality who has been associated with some highly-acclaimed Hindi films. Other than that, the film will see the likes of Kiran Srinivas, Sharmiela Mandre, Samyukta Hornad (best known for acting in critically praised film Oggaranne), and many more. Shooting of the film is completed, the film is slated for an early 2019 release.